You don’t need a smoker or even a grill to make incredible ribs! 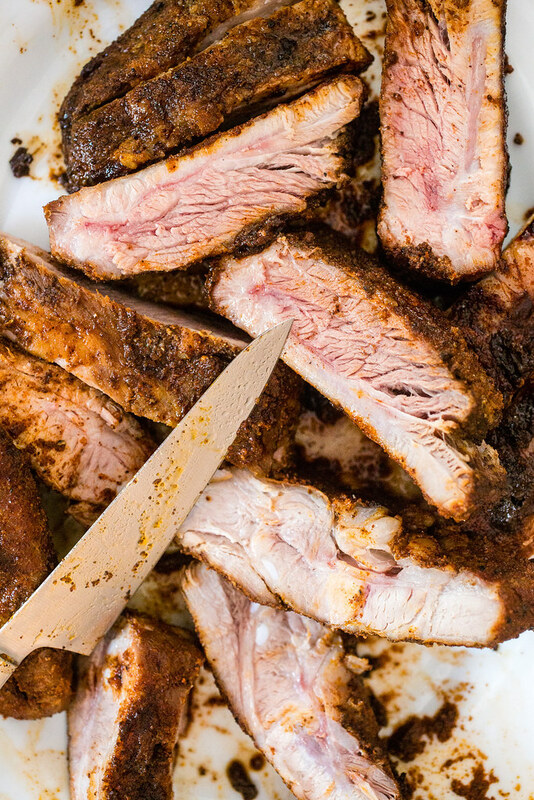 Rubbed down in a quick and easy dry spice mix, these smoky oven ribs will blow your mind. Truly! Over the past few years, I’ve been coming around to the idea of meat on bones. I totally don’t mean to make that sound so weird and slightly crude. But let me ‘splain. I grew up loathing eating bone-in chicken but I didn’t really have a choice when it was roast chicken night since my parents, with their adult appetites, got the carved meat from the chicken breasts. Pork chops were just okay but I MUCH preferred the incredible pork roasts my mom would make where my dad would oh so deftly carve the meat from the bones. And as it usually does, the pendulum has swung the other way in recent years. I’ve finally awakened to the idea that lots of meat options on the bone have so much more flavor than when they’re cooked without the bone(s). Bone-in chicken thighs are a legit thing in my house now, even on the grill (after much ado in years past)! We’ve even made osso bucco – something I would never ever would have eaten 5 years ago. And it was phenomenal! OHHH! How could I forget about those Korean country spare ribs that I’ve made more times than I can count?! Impossible! After all of that, I have to say that these smoky oven ribs rank right up there with some of the best food I’ve eaten. I mean: EVER EATEN. Guys. Seriously. I made them for the first time a few summers ago for a 4th of July gathering we hosted. It seems ridiculous to turn the oven on for hours on end in July but it happened to be a cooler July day and with the windows open, these smoky oven ribs slow-cooked the day away. And every time someone popped in the kitchen that day, the smell of these ribs cooking took their breath away. The only way they possibly could have smelled better is if they were hickory-smoked in a smoker. I have the hickory chips but the smoker, not so much. And that’s why this recipe is so awesome. All you need is an oven! That means it doesn’t need to be summer to make these ribs either! All the better! OK. Enough with the smell of these ribs, right? The flavor is really what we’re here for! One word (since I’m not really known for being pithy): incredible. Fall-off-the-bone tender. Smoked paprika and ancho chile = smokiness! Cayenne (or chipotle!) powder = good spicy factor. 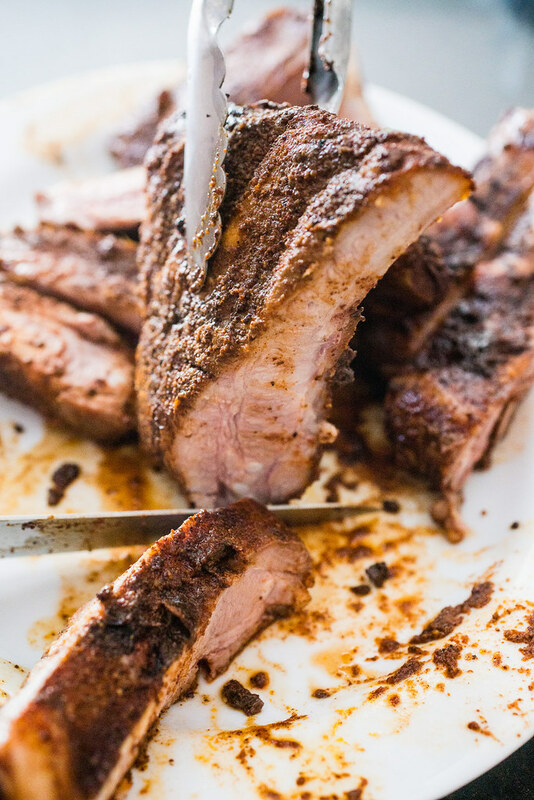 There’s some juice leftover in the bottom of the foil packet that you can boil down and drizzle over the ribs for some extra flavor if you choose to – we liked them as they were without the sauce – but I’m pretty sure no one will complain about an extra level of flavor. Gather your tools: a large baking sheet, an oven-safe wire cooling rack that will fit in the baking sheet, and either extra-wide heavy-duty aluminum foil, regular-width heavy-duty, or regular aluminum foil. Heavy-duty does work best here since the ribs are pretty heavy and you don’t want any juice leakage. 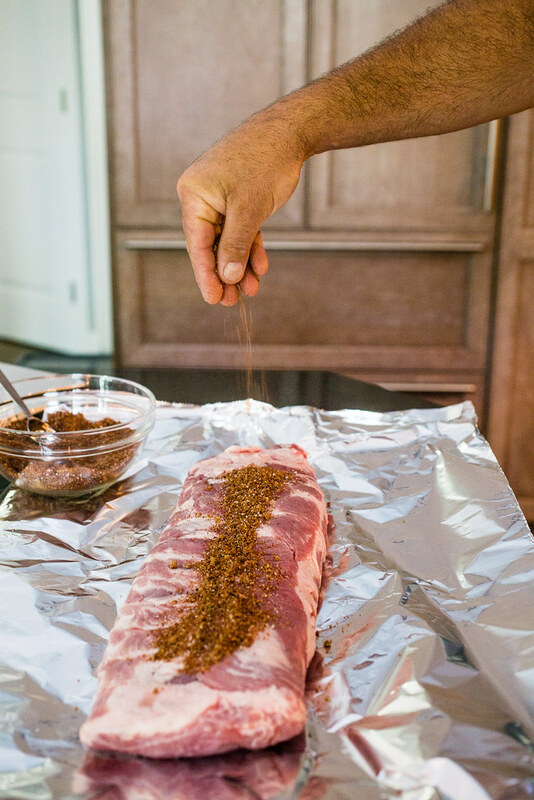 Prep and cook the ribs: Preheat oven to 200° F. Place the wire rack in the baking sheet. In a medium bowl or glass measuring cup, mix the spices together until well-combined. Place the ribs on a piece of foil long enough (or two pieces if you’re not using extra-wide) to wrap the whole rack of ribs. 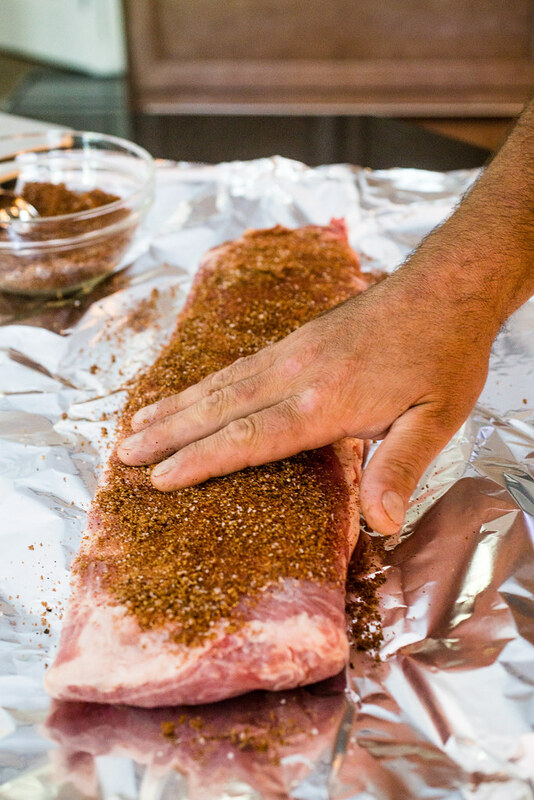 Sprinkle the spice rub over the top of the ribs (meaty side up) and massage it into the meat; flip and repeat on the other side. 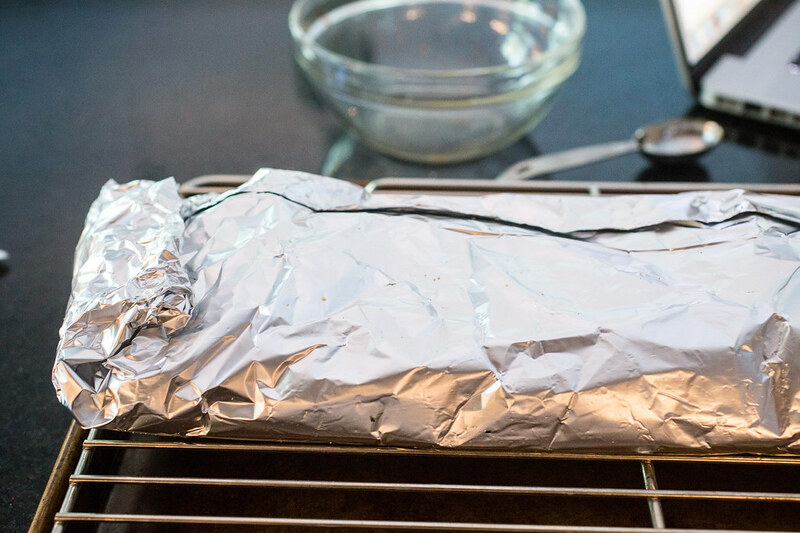 Wrap the ribs with the meaty side down tightly in the foil and transfer the foil to the rack on the baking sheet. Bake for 4 hours then turn the oven down to 175° F and bake for another 2 hours, until the ribs are perfectly tender and just about falling off the bone. If you’re going to make a sauce with the juices, pour them from the foil into a small saucepan. Bring the liquid to a boil and let it reduce to a thick syrup then stir in the vinegar. The sauce will be on the salty side since it’s now concentrated so use sparingly. If you’re opting against the sauce, pour off the juices and discard. 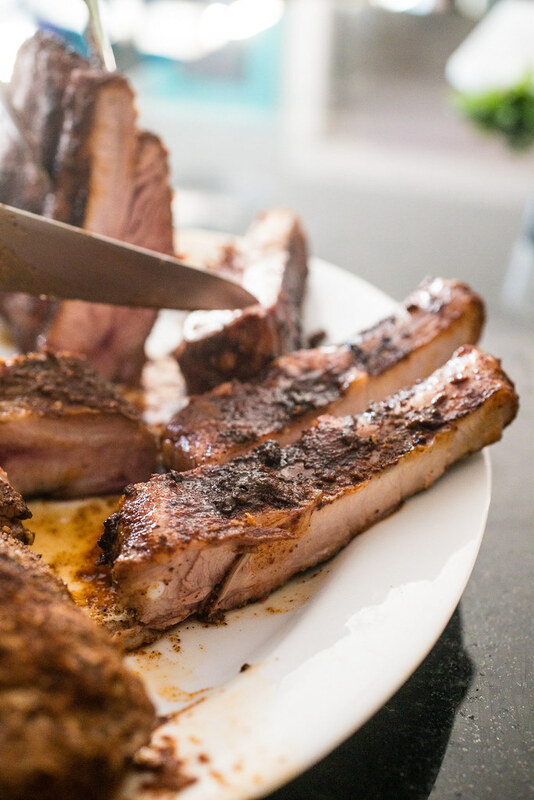 Place the rack of ribs on a large cutting board and cut them apart just up against the bones so that each rib has a bone and a thick slab of juicy meat. Serve while still hot. Fabulous!! Just made them for chilly memorial weekend at the beach!!! 6 for dinner , 3 racks almost devoured!! YAY!! So great, right?! I’m not at all surprised they were almost all devoured!